SOCHI (UrduPoint News / Sputnik - 17th April, 2019) Russian TVEL Fuel Company of Rosatom and Munich-based Hermith GmbH, a leading European titanium alloy supplier for civil aviation, automotive, chemical and other industries, have struck a deal on cooperation in joint titanium production, the statement from TVEL said on Tuesday. "In the course of the XI International Forum ATOMEXPO 2019, TVEL Fuel Company of ROSATOM and Hermith GmbH (Germany), a major European titanium supplier, have concluded an agreement on cooperation in development of titanium production and joint promotion of products to the European and other prominent markets," TVEL announced. 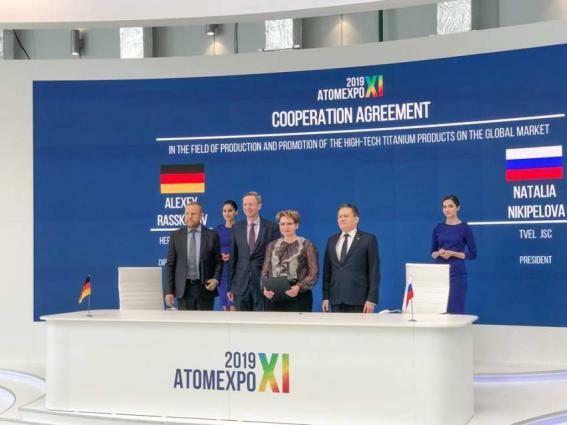 Alexey Likhachev, the director general of Rosatom State Corporation, and Michael Harms, the director general of the Eastern Committee of German Economy, were present at the signing ceremony. The accord provides for joint production of titanium alloy products with high added value for such industries as aviation, automotive and medicine. The companies also consider to establish a joint venture for production of "aircraft tubular assemblies, special wire for additive production, sonotrodes, automobile suspension components as well as implants and prostheses for medicine," the statement added. "We hope that our cooperation with Hermith GmbH, a competent European partner, will help TVEL Fuel Company develop high-technology manufacturing of titanium products with maximum added value and strengthen our presence in foreign markets," Natalia Nikipelova, the president of TVEL JSC, stressed. According to Alexey Rasskazov, the director general of Hermith GmbH, the deal will help to establish "an aerospace and additive cluster in Russia which would be oriented at the markets" across the countries of Western Europe, as well as the United States and Canada.